FlexiFil™ filament is a rubber-like 3D printer filament which allows you to print flexible objects, such as rubber machine parts, soft toys, flip-flops, and other rubbery items. FlexiFil™ filament is a rubber-like 3D printer filament which allows you to print flexible objects, such as rubber machine parts, soft toys, flip-flops, and other rubbery items. FlexiFil™ opens doors to a whole new field of application when it comes to desktop 3D printing. It’s up to your own imagination what you would like to create and print. FlexiFil™ is a flexible Thermoplastic Co-Polyester 3D printer filament with a Shore hardness of 45D. FlexiFil™ is a revolutionary new rubber-like high-performance Thermoplastic Co-Polyester (TPC) filament. FlexiFil™ has unique flexural strength properties, as 3D printed objects with FlexiFil™ will have a “flexural memory”, allowing objects to return back to their original position after being bent, dent, or folded. FlexiFil™ is not only a flexible filament. It has quite some more remarkable characteristics. FlexiFil™ is a high-performance TPC that offers a unique combination of flexibility, high temperature resistance, strength, and an excellent UV resistance and good resistance to chemicals. The combination of above features make FlexiFil™ a unique filament in its kind. FlexiFil™ filament is a BIO-performance TPC with a substantially reduced carbon footprint compared to typical Co-Polyester 3D printer filaments, as FlexiFil™ is partially made out of renewable carbon content, such as bio-based oils. The Charpy Notched Impact Strength Test method indicates “No Break” for FlexiFil™, meaning that FlexiFil™ will not deform, or break when stressed by bending. FlexiFil™ filament has a great roundness and very tight diameter tolerances. 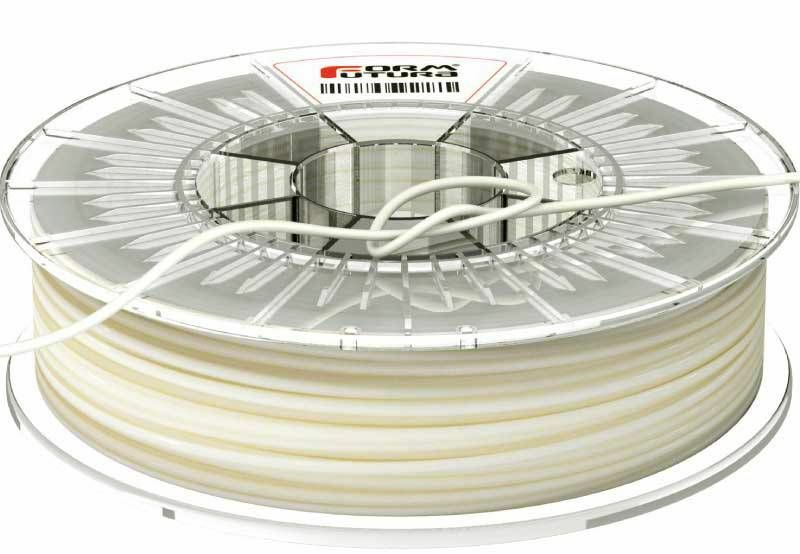 This flexible TPC 3D printer filament is spool-wrapped on a polystyrene plastic spool with 500 grams of filament. It is recommended to significantly lower your printing speed (compared to printing with PLA, or ABS) when printing with FlexiFil™. The guideline for an optimal printing temperature is to print at approximately 210°C. The recommended heated bed temperature varies between ± 60˚C and ± 100˚C. Various other options (also without heated bed) are possible depending on the type and size of the object to be printed. In order to get a good first layer adhesion it is important that your print bed is really level and clean. Depending on the printer it can also help to use a glue stick to improve the first layer adhesion. A combination of Blue Tape, like and glue stick can also do wonders. Why not try our unique printing surface PrintBite. The flexibility/rubbery characteristics of FlexiFil™ can cause some friction in the printer’s bowden tube, resulting in unstable feeding process of the filament into the extruder. As a remedy one can use a tiny bit of lubricant – like WD40 – in one’s bowden tube in order make sure there won’t be any friction. Please do keep in mind that above recommendations are only guidelines and that every desktop 3D printer requires different settings for optimal printing results.